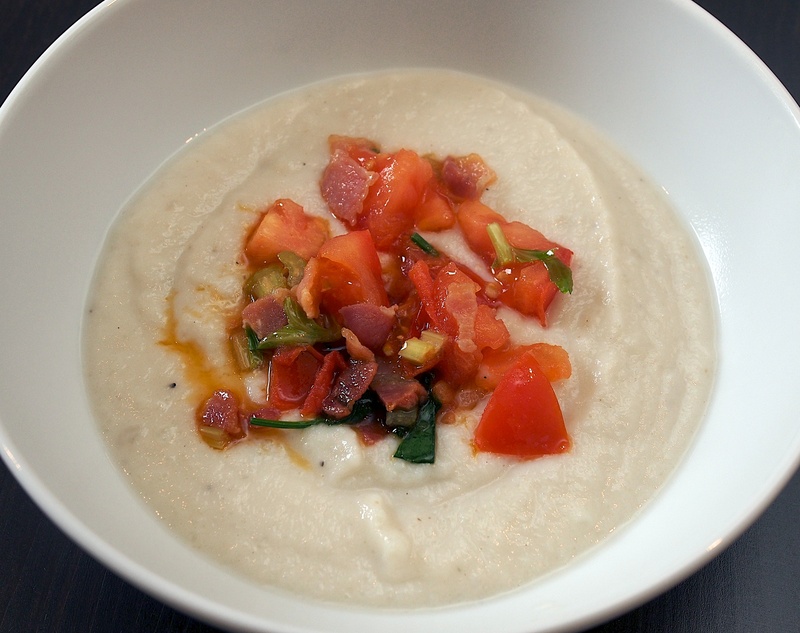 This is so refined in flavour and texture with the creamy and elegant soup working perfectly with the crunchy topping of celery, pancetta, garlic and fresh tomato. Highly recommended! We’re a bit late with the recipe as Jerusalem artichoke season finishes in March but they’ll be back again at the end of the year and they’re probably still around somewhere in the world. Peel and chop the Jerusalem artichokes into even sized chunks. Simmer in the water until tender, then drain and purée with a stick blender. Heat up the artichokes and gradually add the milk. Heat the olive oil in a small frying pan and fry the tomatoes, garlic, celery, parsley and bacon for just a few minutes, then pour into the soup (along with the oil).